Today we have the second part of an article by Jonathan Burgess author of the successful False Favourites lay betting system. Most punters simply do not have the mental willpower to ride out even the most modest of losing runs! Pay particular attention to the BSP profit columns. You’ll notice the losing months are highlighted in red. Both Over 22 and Stable Investment tipping services had 5 losing months this year. Imagine you had subscribed to the Over 22 service in January 2012, during which there was a -16.92 loss. How would you have dealt with that situation? Be honest with yourself – would you have continued with the service or cancelled your subscription? Obviously I would not assume how you might react, but my experience of dealing with many different types of punters tells me that fickle Gamblers would have unsubscribed at this point thinking the service was useless. By doing this they would have missed out on three subsequent months of profit February 2012 + 24.87, March 2012 +70.84, April 2012+12.34. These profitable months were then followed by three losing months, but at this point in time the service has made a profit of +67.43 points profit if betting all selections to Betfair SP. Imagine you had subscribed to the Stable Investment service below, in January 2012. A respectable 9.54 points profit was followed by what most of us would consider a disastrous three months, losing over 112.59 points. 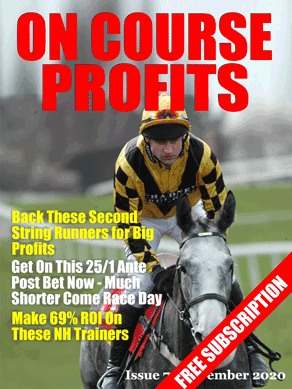 Betting their selections for just £10 stakes would mean you`d be £1125.9 down for that period. At this point most punters would have bailed out of this service concluding it was absolutely useless. If we minus the three-month loss of £1125.9 from the profit of £3320.3 that would have provided a profit of £2194.4 up to that point. There were two more losing months followed by a profitable month. So far this year Stable Investments has made over 220.86 points profit, even with five losing months. Again, if you look at the monthly breakdown of the Over22 Lay service results, you’ll see there are two losing months so far this year. There are two types of bettor; can you guess which one makes a profit? Gambler: at the first sign of any losing run, starts to chop and change, by betting on some selections but not on others, or worse stops betting altogether. Ultimately misses out on making a long-term profit because he did not bet on the selections that won and actually provided the profit. So as you can see the road to profit is never even, consistent or smooth. And this is the whole point I’m trying to make. Gamblers never make a profit; investors who can follow instructions, not lose their nerve and keep a clear head eventually make a profit when following a profitable betting system or tipping service. Remember: In order to make a long-term profit you must back or lay all selections, when following a betting system or tipster. When backing horses you have to accept that you will back more losers than winners. As long as the winners are offered at value odds a profit will be made when they come along. Since he doesn’t state the stakink plans for these services, then its reasonable to assume a standard 100 point betting bank. In which case Stable Investments blew out the bank of anyone starting before 1st February. Just based upon the few figures given, it would require a betting bank of at least 400 points. It is no wonder that bettors lose money on such services when the Tipsters greed makes them claim high points results without considering how anybody could survive the drawdowns.